Local DAB officially launches in Somerset today bringing listeners an additional choice of BBC and commercial radio across the county. 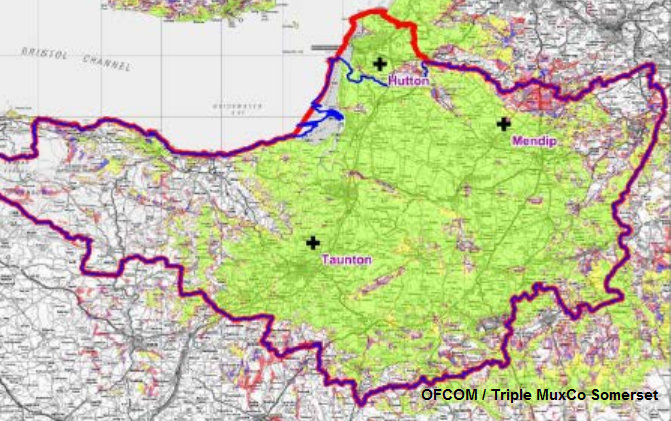 Listeners can tune into the new local DAB multiplex and receive five services broadcast from transmitters at Taunton, Hutton and the main Mendip transmitter. The new multiplex launch follows several weeks of test transmissions across the county on VHF frequency block 10B. In addition to BBC Radio Somerset, listeners can receive their regional version of Heart, plus new station Triple Hits. Smooth Radio launches on the multiplex, ensuring Somerset listeners can continue tuning into the station after the proposed future switch-off of Smooth from the national digital multiplex. Hit music station Capital FM is the fifth service now available via DAB in the county. According to DAB multiplex opeator Triple MuxCo, in Somerset, 44% of the population have access to a DAB digital radio, and in Q2 2014, 37% of radio listening hours are to digital platforms. A cumulative total of over 19 million digital radio sets has been sold to date in the UK. 55% of new cars now come fitted with digital radio as standard (CAP/SMMT July 2014). The BBC has produced retuning guidance for listeners wanting to receive BBC Radio Somerset and other local DAB stations on the new multiplex.